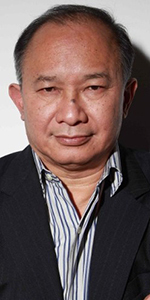 John Woo is a director known for his hard-hitting action films, which are festooned with kinetic action sequences. After initial success in Hong Kong, he started a craeer in Hollywood, but has since returned to his native China to make some serious historical dramas there. Woo's Hollywood films have grossed over $1 Billion worldwide. Woo was born during the last phase of the Chinese Civil War to Christian parents, who fled to nearby Hong Kong after the victory of the Communists. Living in the Shek Kip Mei slum, his father was a lowly teacher, while his mother was a construction worker. The family became homeless as a result of the slum burning down in 1953. Young John was diagnosed with a spinal injury and was treated. He was not able to walk correctly until his eighth year. Leaning toward the ministry, Woo found a different religion — the movies. Shy and withdrawn, Woo found films the ideal channel for ideas and feelings. Woo entered the biz as a script suprevisor in 1969 at the Cathay Studio in Singapore. By 1971, he was working for Run Run Shaw as an assistant director; he was AD on five films in 1972, three more in 1973. Woo kept busy, as the Hong Kong action film was picking up steam after the success of Enter the Dragon (which played the Chinese in August, 1973). Woo got together with Enter the Dragon producer Raymond Chow and fight choreographer Jackie Chan and directed his first film, Tie han rou qing - The Young Dragons (released in July, 1974). Woo would continue making films in Hong Kong with Chow's Golden Harvest outfit: the historical romance Dinü hua - Princess Chang Ping (released in January, 1976) with Kim Sung Lung, and the martial arts picture Shao Lin men - The Hand of Death (released in July, 1976) with Tao-Liang Tan. But more typical were several comic films like Fa qian han - Money Crazy (released in July, 1977) with Richard Ng; Da sha xing yu ziao mei tou - Follow the Star (released in February, 1978) with Rowena Cortes, and Qian zuo guai - Money Time (released in July, 1980) with Ricky Hui. Woo even directed a remake of Neil Simon's The Sunshine Boys called Xiao jiang - The Time You Need a Friend (released in January, 1985) with Yueh Sun. Dissatisfied with cranking 'em out for Chow, producer Tsui Hark allowed Woo to make a significant step forward with Ying hung boon sik - A Better Tomorrow (released in August, 1986) with Chow Yun-Fat. The "gun-fu" film was so successful, that it was followed up with a sequel: Ying hung boon sik II - A Better Tomorrow II (released in December, 1987) again with Chow Yun-Fat. Woo's international breakthrough film was Dip huet seung hung - The Killer (released in March, 1989) with Chow Yun-Fat. The picture was kinda picked up by Miramax Films, and became the top-grossing Chinese import in the U.S. after Enter the Dragon. After sliptting with producer Hark, Woo self-financed what many consider his best film: Die zue jie tou - Bullet in the Head (released in August, 1990) with Tony Chiu-Wai Leung. The film did not do well in Hong Kong, and wasn't even picked up by an American distributor. Lat sau san taam - Hard Boiled (released in April, 1992) with Chow Yun-Fat, cemented Woo's reputation as the leading Hong Kong director of furious action pictures. Director Sam Raimi became Woo's executive producer on his first Hollywood film: Hard Target (released in August, 1993) with Jean-Claude Van Damme. 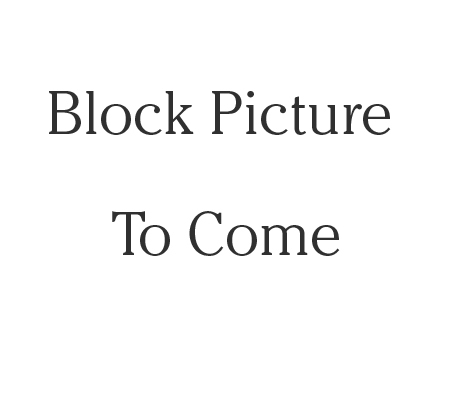 Woo, unused to Helicopter Hollywood, had the picture taken away from him in post-production, causing Woo to take stock of his position in Tinseltown. Three years later, he directed Broken Arrow (which played the Chinese in February, 1996) with John Travolta; he would direct Travolta again in Face/Off (released in June, 1997) with Nicolas Cage, which became a sizable hit. It took another three years for Woo to direct Mission: Impossible II (which played the Chinese in May, 2000) with Tom Cruise; it has become Woo's biggest money-maker, doubling the take of Face/Off. Woo came to the Chinese Theatre to place his imprints just prior to the release of Windtalkers (which played the Chinese in June, 2002) with Nicolas Cage; he also directed Paycheck (which played the Chinese in December, 2003) with Ben Affleck. Woo retrurned to China to film the two-part telling of the battles during the Three Kingdoms of China in 220 A.D.: Chi bi - Red Cliff (released in June, 2008) with Tony Chiu-Wai, and Chi bu: Jue zhan tian xia - Red Cliff II (released in January, 2009). These films did well in China, but have not really been seen in the U.S. He co-directed Jian yu - Reign of the Assassins (released in September, 2010) starring Michelle Yeoh. The Crossing (released in December, 2014) with Ziyi Zhang, wove a 3D tale of the lives of refugees from China's 1949 Cultural Revolution fleeing to Taiwan. The two-part film's second half is The Crossing II (released in July, 2015). Zhui bu - Manhunt (which premiered in September, 2017 at the Toronto Film Festival, but was heavily re-cut by its distributor in China) starred Hanyu Zhang. It has not be released in the United States. Grauman's Chinese Theatre, Hollywood, California. John Woo Forecourt ceremony, Monday, May 20, 2002. 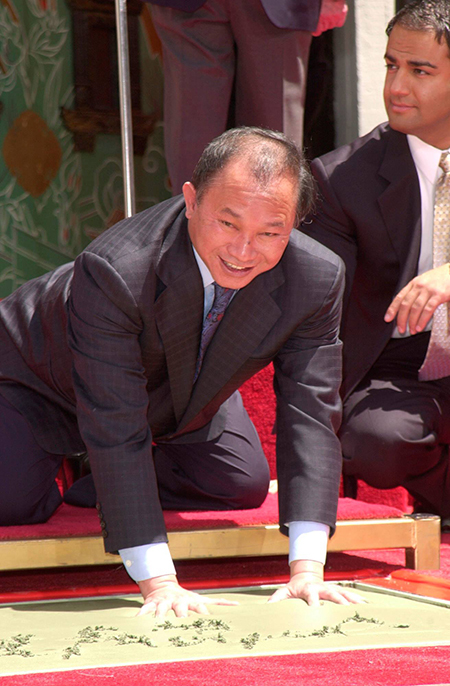 John Woo gives a grin as he places his hands into the cement.